I have a couple of portable electronic devices that don’t loose their memory when I replace the batteries. I thought it would be nice to know how to do that, should I ever want to. I picked up two 0.47F 5.5V capacitors from All Electronics for $1.65 each. I finally got around to figuring out how to use them and built an LED circuit and an ATTiny 85 circuit both of which are powered by the super capacitors. In my research I found it is really important not to exceed the capacitor’s rated voltage which is typically pretty low. There are plenty of videos on youtube of people exceeding the voltage and blowing them up. The other thing is to be very careful about polarity. They can be easily damaged if connected up backwards. First, I connected 1 supercap and the LED/resistor into the circuit. It took approximately 1 min 14 secs to charge the cap to 4.5v (this is charging the cap and driving the load at the same time). This circuit ran for about 15 minutes. At that time it was at 2.3V and the LED was very dim. I then removed the stand along LED connected the ATTiny85. It is simply running the standard blink sketch. This ran for 13 minutes at which point the cap was at 2.2 volts. The LED was very dim but blinking regularly. After another 2 minutes the LED was barely visible but blinking regularly and the voltage was 2.2V. I then connected the 2nd super capacitor in parallel which would give me .94F. Charged them both up in about 2 minutes. With both capacitors, the ATTiny ran for 25 minutes. 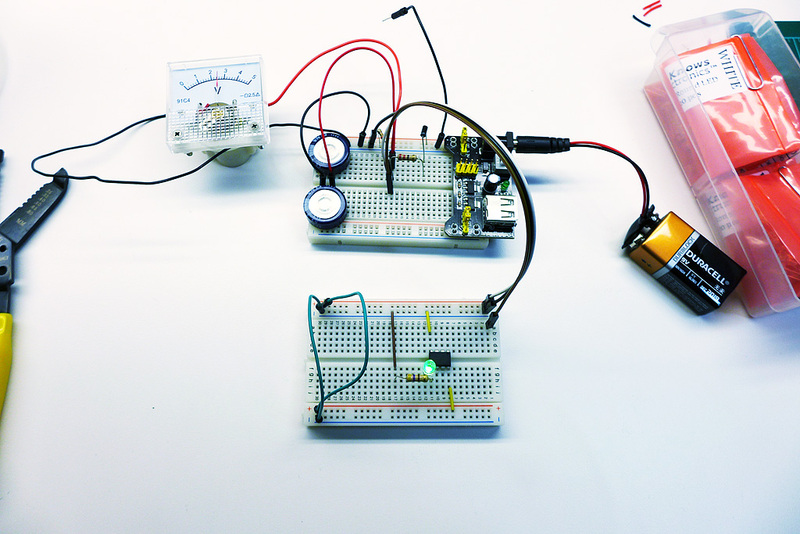 This entry was posted in c-electronics and tagged supercap test circuit. Bookmark the permalink. Ouch on the unit price, but quantity is king. I use them as an optional add-on to a Joule-Thief inspired boost circuit (reverse biased zener in place of LED, and a filter capacitor for output) which I developed for some projects – the circuit boosts to 5V, which charges the ultracap, which in turn ensures if the driven project demands current (such as blinking an LED, driving a piezo, or firing up a radio module to transmit some data), it’s there and won’t reset the uC due to the voltage dip due to the low power nature of the boost module. I can charge them from a 2V solar cell (or a <1.5V battery) using the boost circuit. The cap can store a surprising amount of power. Do the math on the Joule capacity: E = (1/2) C V^2 where E is Joules and C is in Farads. As a baseline, consider a 3000uF cap charged to 100V = 15 joules (that gives a nice crack when shorted, and can weld small conductors together). That's a pretty large electrolytic – not a beer-can sized one, but about the diameter of a good whiteboard marker and about 4cm or so long. Now consider your 0.47F at 4.5V = 4.759J. A 1.5F charged to it's rated 5.5V would be 22.688 Joules (and 15.188J at 4.5V – yea, look at the comparative energy there for a difference of 1 volt). That same 3000uF cap at 4.5V would be only a measly 0.03 Joules. If you do the math for your functional drop out voltage and subtract that from the result from your charged cap, you'll have your useable power: Let's say 2.5V is your drop out (something above a faintly visible LED): 0.47@2.5V = 1.469J. 4.759-1.469 = 3.29 Joules of useable energy. To obtain the useable energy in one equation: E = C/2 * (V(max)^2 – V(min)^2). A bit of algebra, and you can take a known power need and voltages, and compute the size of the ultracap you need to supply the circuit (with some padding, hopefully). Higher capacitance is a two-edged sword though: given the same charge and drop out voltages, the capacitance ratio will reflect equally in the stored energy: 1.5F / 0.47F = 3.1914x — so a 1.5F cap would provide 10.5J of useable energy to your circuit (between the charge and cut-out voltages), but when at the drop out for your circuit, the 1.5F ultracap would have 3.1914x the energy still in it — that is, the 1.5F cap will have a reserve equal nearly to the fully charged 0.47F cap! That energy isn't useable by your circuit, unless you resorted to boosting of course (in which case your drop-out voltage would be lower, and you're still dealing with a multiple of total reserve energy). If the cap is fully discharged, that reserve needs to be charged up before the cap is capable of contributing to your circuit. In practice, not necessarily a big deal if the circuit is running all the time – more of an issue if it is turned off for a period, and the cap eventually discharges (though the ultracaps hold a charge for quite a while). Note when you connected the second cap and charged them both – had you discharged the first, or was it still sitting at the circuit cutoff voltage? That would explain the less than 2x charge time to charge them both. With typical lifetime specifications at some 500K charge cycles, ultracaps are WAY ahead of rechargeable batteries for a low power device. With rechargeable batteries, you can figure you'll be replacing the batteries in a couple of years. Spec'd right and with padding for age, the ultracap could easily be in service for 10+ years of operation. FTR, The Jul-Aug 2013 issue of Elektor Magazine (a UK analogy to Circuit Cellar Ink, and in fact runs a few identical columns, usually on a different publication cycle), contained an article "Store it Quicky 2.0" by Jurgen Werner. That article describes an improvement to an earlier version. The end result is a circuit with a regulator, diode, voltage comparator, 5 resistors, and two (small) caps, using an interrupt input on the uC, rather than relying on the uC itself to periodically perform a voltage check. A benefit to this approach not mentioned in this article is that even if the uC is in sleep, so long as it has been configured to wake on interrupts, it'll be able to run it's shutdown procedure (save to flash, etc). This is applicable not only for unintentional loss of power, but also just responding to power being switched off. The cap sizing wasn't for keeping the uC operating continuously. This is likely more along the lines of the battery swap without loss of settings you were seeing in your example. Also, so long as your device (and its peripherals) can operate on a battery voltage minus a diode drop, you can use a simple backup battery (even a lithium coin cell) – whenever the external power drops below the battery – diode, your device would merely be running off of the backup battery. So long as the supply is higher than the battery, the battery won't be drawn from. If your circuit monitors for this state, it can cut power to external loads (and/or cease driving/sinking then directly): a display, etc can be turned off, but the device can still track status (as appropriate).